The cephalothorax and pedipalps are red-brown; the opisthosoma olive green, and glossy; length of body: 1.8–2.0 mm. Most of Europe: England, Norway, Sweden as far north as Finland and Lapland; eastwards to Hungary, Romania and Yugoslavia; also Switzerland and N Italy. In Britain the species has been found in scattered localities in the north, East Anglia and the south. The paucity of records has probably been a result of confusing it with L. nodosus. Check the knob on the pedipalpal trochanter! Lamprochernes chyzeri occurs beneath the bark of old trees such as beech and birch and it is phoretic on flies. There have been records from compost heaps. 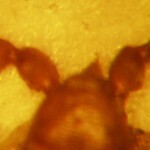 Prosoma of Lamprochernes chyzeri showing the form of the pedipalpal trochanter in dorsal view. 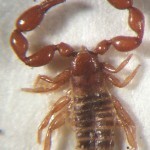 Downward face view of Lamprochernes chyzeri showing pedipalal trochanter.